Looking for great car pranks? You've come to the right place. Check out the ones below. You'll need a realistic looking fake hand in a sleeve. Tie the hand to the muffler or rear bumper of your victim's car. Make sure the string you use is long enough to be able to hide the hand under the car, and for the hand to make its appearance as it's being dragged by your victim. This is a good car prank that has both horror and humor. Mainly horror for passers-by who think that someone is being dragged, or that there was a very painful hit and run accident earlier. The humor is mainly for you :). Once again, you'll need a realistic looking fake hand in a sleeve. This time, open up the front or back car door on the passenger side and close it on the sleeve of your fake hand. That way, the fake hand will be dangling out of the door out of your victim's sight (if he drives alone). Imagine the shock of the pedestrians when they see a hand dangling out of the car door when your victim drives by. Alternatively, dangle the hand out of the car boot by closing it on the sleeve. However, the chances of the hand being found by your victim before he drives will be pretty high compared to setting it up by the door. If your victim's seats are dark colored, sprinkle some charcoal dust on it and blend it in. Use colored chalk or baby powder for lighter colors. Now if your victim wears something that doesn't match the car seat, he'll get stained soon enough. Oh yeah, don't leave out char-coaling the seat-belts. It's a great car prank, but one that could make your victim really annoyed! Want to freak out your victim by making him think a hefty repair bill is coming his way? Plant a fake windscreen damage gag toy on his windscreen. Imagine his panicked expression when he thinks that someone threw a stone at his car! Even better if you can distract him again and remove it without him looking and make him think he's gone crazy. You'll need to fill the car trunk with helium balloons for this great car prank. When your victim tries to get something from it, all the balloons will duly float out of the trunk. How do we get the balloons in? Use a covering of any material, e.g. cloth, cardboard or even plastic, and lay it on the open trunk. As you fill the balloons, stack them under the covering. Once you're done, just half close the trunk and remove the covering. The half-closed trunk should prevent the balloons from escaping the trunk. Alternatively, open the trunk slightly and just stuff the balloons through it. Personally I find this to be much slower and it's harder to see if you're almost done filling the space of the trunk. Enjoy this great car prank! You can try a classic prank that involves stuffing a potato in the muffler. Legend has it that the offending potato will be shot out of the muffler forcefully once the car is running. I've heard of some pranksters using bananas as well, but I haven't verified that. What if you could stuff something that would make the car whistle instead? I came across a trick exhaust whistle that you can use on a running car. Stick it in a muffler and it'll whistle and shriek as the car exhaust runs through it. It's a great car prank for the sneaky. You'll need to get some liquid food coloring. Pop-up the car hood and drip some coloring of your choice into the wiper fluid. The next time your victim tries to clear his windshield, he'll get a surprise when the wiper fluid comes out! Loosen the nuts on the wipers. They may be covered by rubber plugs as shown in the picture, so remove those to gain access to the nuts. When your victim turns on the wipers, he'll hear the wiper motors running, but no wipers moving! Simple, isn't it? 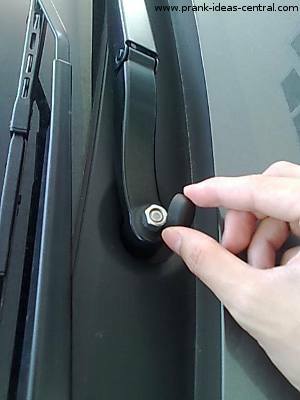 Inside the car, tie a fishing line from the driver side door handle to the passenger side door handle. Make sure it's nice and taut so that when your victim tries to open the driver side door, the rope will pull on the passenger side door keeping the door shut. Once you're done, crawl into the backseat and exit the car from the rear doors. Your victim might not see the fishing line at first, especially the prank is pulled at night. It'll be funnier still if your victim has a passenger to tug with. Every so often you can contribute to your victim's fear of going crazy or senility by shifting his car around the parking lot. Park the car at the other end of the same lot or on another lot. Another idea is to change the orientation of the car. Have fun with this one and use it sparingly or your victim may just catch on to your prank. Mos people I know quickly take note of any unusual noises they hear in their running car. In this great car prank, you'll be putting in the noise for them to find. Place some marbles in a small tin can. Then find a place to hide it in the car. Taping it to the bottom of the driver's seat is usually good enough. Once the car starts moving, the rattling will begin, prompting your victim to look for the noise. If you're on a long road trip and you're lucky enough that one of your passengers is asleep, get the others in on this great car prank. Be sure you're on an empty road, then cue them to scream on a count of 3. On the third count, apply your car breaks and start screaming. You'll end up scaring your victim wide awake.